Ok, probably not bike bits. I’m just going to stick to riding for a while and not saying anything else about bikes for a bit, especially since people that ride bikes don’t seem to actually READ my blog before rambling on death threats and such. But woe is me the ever writing transit user. So yeah, love blogs, hate taxes, on to new topics. So any new readers please note that I’m very pro-bike, so don’t get fussy (Argh I couldn’t not comment). I love cycling, I have since I’ve lived in Mississippi and even after ALL 6 incidents where a motorist has hit me. All the motorists where at fault btw – just so you know. Two of those have been here in PDX. So I know what it is like to be threatened by automobiles. It’s a little different than being annoyed by a cyclists blowing a stop sign. A cyclist might get killed, but if you’re driving your greatest threat is the other vehicles (and yourself) on the road, not the cyclist. Ok, as expected (by me) the new streetcars will be $3.4 Million EACH! That’s a FULL MILLION above the price of the original cars that where shipped from the other side of the planet. We get them in country and they just balloon to $3.4 Million each? I call foul. People are a fuss about prospective bike taxes, they need to get a fussing about the price of the streetcars. I want service, I want frequency, I don’t care that they’re spiffy looking new ones. I WANT MORE STREETCARS but without the obscene stupid price tag. Take out the twisty parts, buy some smaller ones, do something. Sam Adams, Fred, and the rest of you guys come on! GO PRICE SHOPPING for some streetcars dammit! 204 where purchased recently by our northern Canadian neighbors who are paying significantly less than we are. If we piggy backed on that order we could get them for almost a million less per car. In addition we could probably still get something built HERE in America for vastly less money. What are you guys doing? Are you ignoring the price tag on these things and just hoping the streetcars will breed like rabbits or something? Come on! What streetcars need is the wisdom of the elders. The PCC cars — like the ones on San Francisco’s Market Street — tackled this problem. How? 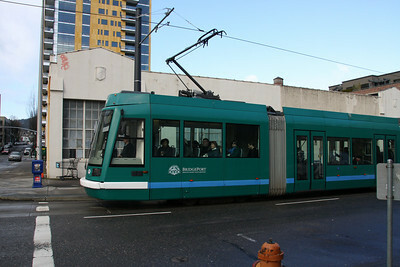 The streetcar companies determined a standard design and had builders designing to specs and competing over price. The PCC cars were "open source" before the term was even coined! The federal government had attempted this with the advanced-design bus in the late 1970s. It didn’t really work, because most companies designed a new bus because that was a requirement. New, not better. The whole era ended up being a fiasco because the winners turned out to be defense contractors like Rohr and AM General — with no background in bus engineering. Two notable ADB designs were picked up — the Rohr design became the standard for the now-defunct Flxible. The RTS was another ADB, and the initial models were pretty brutal. However, it was GM’s fine-tuning that enabled designs to be improved and lasting for nearly 30 years. GM got out of the bus business in the mid-1980s. The returns were poor for heavy equipment like buses. That’s why GM got out of bus building. As for the quality of GM buses … well, it got rid of the only vehicles they made that were both long-lasting, rugged and highly reliable! And just because GM sold buses before doesn’t meant it can be revived again. The cutting edge of bus technology is now in Europe, with Canada a little bit behind. America’s last domestic-owned bus maker, Gillig, doesn’t even offer its own alternative-fuel models without an aftermarket modification! Oh, weren’t we talking about streetcars? The best way to bring down costs is to first of all make sure the feds aren’t looking. Namely, do not use federal capital or transit subsidies. The problem begins with Buy America laws. You bring down costs by buddying up with other cities that want streetcars, and buying a batch of hundreds of cars at a time and divvying them up at delivery. Also, you want the builder to offer good options terms. Options are like stock options. The builder gives you 2 or 3 years to buy a set amount of additional units at the same price. The costs for the builder go up, while the sticker price remains the same for the agency.